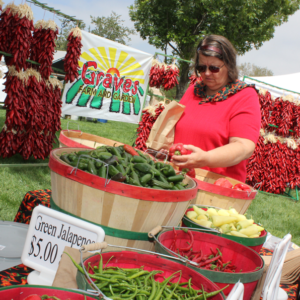 The best home-grown chile in New Mexico! Welcome to Graves Farm and Garden! Thomas Graves and Bessie Williams married in 1910. They moved to Kenna, New Mexico by covered wagon, where they settled on Government granted land that was earned after developing it for seven years. They had three sons Howard, Hugh & Earl. In 1936, they moved to Roswell and settled the first homestead of Graves Farm. 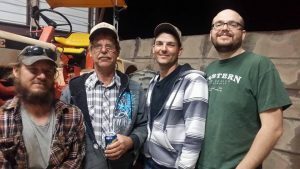 Thomas retired in the mid 1950’s so his oldest son Howard and youngest son Earl followed in their father’s footsteps by continuing to run the family farm. Earl was born here in Roswell in 1933 to Thomas and Bessie Graves. He grew up running the farm with his oldest brother Howard Graves, and in 1964 partnered a farm with Howard and Howard’s son Lynn. He Married Pat Williams in 1951. They had three children Patricia, James and Sherrie. Later, he married Roetta Pickering in 1963, two years later they had their youngest son Steven Graves. Out of his four children his oldest son James (Buz) Graves took and interest in the farm, he began working along side his father until Earl’s passing in 1992. James (Buz) started farming as a young boy and continued well on into his adult life. In 1981 he married Ronda Bare. They have three sons together Daniel, Zachary, and Andrew. 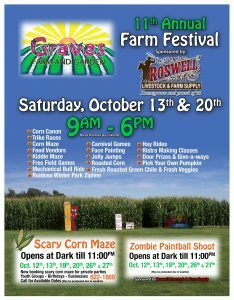 Our annual fall farm festival is in October! It is great fun for adults, children and families, with many activities including Hay rides to the pumpkin patch, farm strong competitions, cow milking, duck races, pumpkin toss, potato pitch, irrigation contest, kick the can, water melon eating contest, corn shucking contest, zip line, lot’s of food, free prize given away all day long, pony rides, sack races and tug-a-wars, and much more. Or you can get lost in the Corn Maze! Don’t forget the maze takes on a whole new meaning at night! We haunt the Maze on the weekends during October. Our Corn Maze is Open Weekends in October – Dark to 11:00 pm. 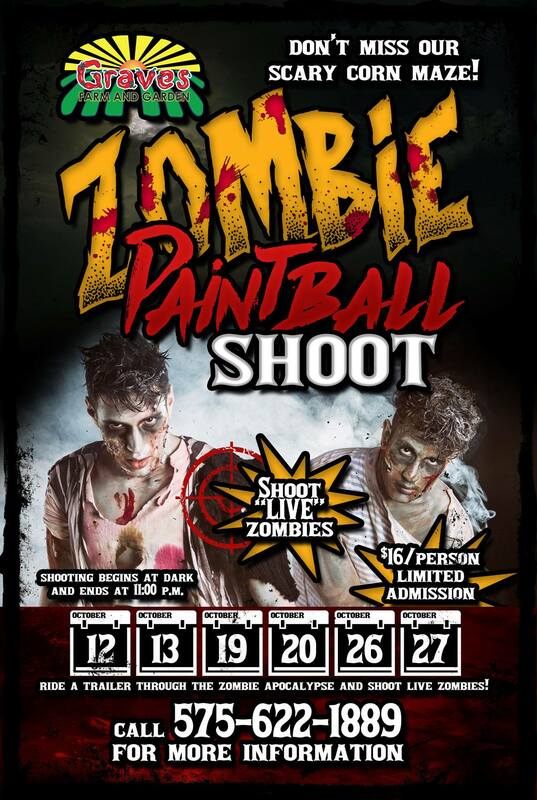 It is great fun for adults, children, families, youth group, school field trips and just getting together with some old friends. Come get lost, and spend some quality time with your family. Teach your children all about the “Farm Life”, and where there food actually comes from. 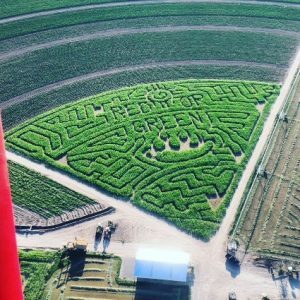 Follow the “Farm clues” to make your way through the Maze, and have a load of “good ole’ fashion fun.” Don’t forget the Maze takes on a whole new meaning at night! We haunt in the maze on the Friday and Saturday nights in October. 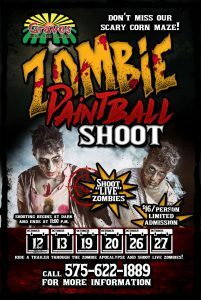 Tickets sold on a first come first serve basis. Graves Farm has been farming green Chile in the Pecos valley for over 30 years. James Graves started selling fresh green Chile in his front yard, along with roasting it. The rich soil and climate of the Pecos valley was perfect for green Chile to grow and thrive! Then vegetables followed. 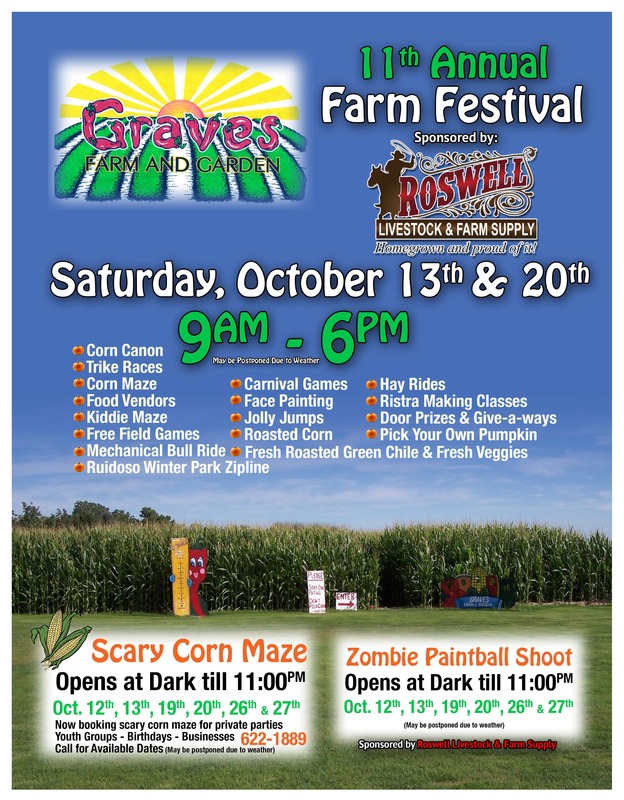 Graves farm and Garden is a staple of the annual Main Street Roswell Chile Cheese Festival. Get your fresh roasted green Chile, or a beautiful red Chile ristra while enjoying great, free, family fun! Fresh green Chile has always been our specialty. Chile Cheese festival is in Sept. 2016. Please visitwww.mainstreetroswell.org for date & time.